Whether you’re building a new home or looking to upgrade existing windows, two popular choices include fiberglass vs. vinyl. Both are good choices, but fiberglass does have a few advantages over vinyl. Of course, you’ll pay a premium for fiberglass, but you may find the added cost worthwhile. Read on to learn more about these two materials so that you can choose the right windows for your home! There are lots of benefits to fiberglass windows. Chief among them is the durability. These windows are made to last, even against damaging UV sunlight and other environmental factors like salty sea air. In fact, fiberglass windows like Marvin’s Ultrex windows are up to eight times stronger than windows with vinyl frames. One of the only materials stronger than fiberglass is steel framing, which can be more expensive and more difficult to maintain. Fiberglass also stands up to temperature extremes. Where some windows may warp or crack as seasons shift between hot and cold, fiberglass is breathable, which means it doesn’t expand and contract the way other materials do. This is important because it helps prevent drafts as the windows age. Vinyl, wood and other materials that are prone to shifting with temperature changes will often develop leaks around weather stripping and other seals, which degrades energy efficiency with time. Another great benefit is that fiberglass can be painted. In most cases, your new fiberglass windows will come with a powder finish that won’t need maintenance as the years go by. However, if you’d like to change the look of your home, you can easily change the colors with a coat of paint. And, if you like the look of wood, this is another advantage that fiberglass has over vinyl. You can purchase fiberglass frames that are made to look like wood, whereas vinyl only comes in a few select solid colors. If you have concerns about the environment and energy efficiency, fiberglass is unique in that it doesn’t emit volatile organic compounds (VOCs) over the course of its life. Additionally, these are energy efficient windows — the frames perform as well as vinyl when it comes to thermal transfer. Finally, there is home value to consider. Fiberglass is considered by most to be an upscale material, which means if you’re looking to sell the home, these windows will add a bit more to the sale price than vinyl. Vinyl windows perform similarly to fiberglass in that they tend to be energy efficient and they won’t need much maintenance over their lifespan. One benefit to vinyl over fiberglass, however, is that it usually costs less to buy vinyl windows. 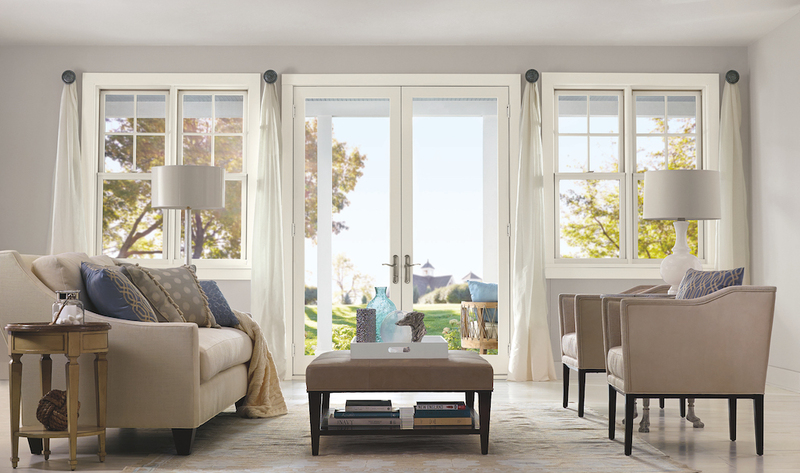 On average, you can expect to save 30% on the cost of windows if you go with vinyl instead of fiberglass. But, for that reduced cost, you’ll also lose some durability, since fiberglass windows are stronger and less likely to warp. Vinyl isn’t considered as eco-friendly, either. While you’ll get similar energy savings as you would with fiberglass, fiberglass is made with up to 60% glass, which is a recyclable material. If you’d like to learn more about Marvin’s line of Integrity Windows and Doors, check out the video below, in which Kathleen Way, a Boston developer, uses Ultrex fiberglass windows in a new construction project.